The demand for nursing assistants, home health aides, and personal care aides is increasing as Baby Boomers move into retirement. The Paraprofessional Healthcare Institute (PHI) estimates that these and other direct-care jobs will be among the fastest-growing occupations in the United States, with significant increases having started in 2008 and expected to continue until 2018. To address these and other ongoing issues with direct-care workers, Caring Across Generations, a national campaign consisting of 200 coalition partners, has developed the “Five Fingers of the Caring Hand” as a way to reform federal policies on long-term care. One of the components is to improve labor standards for direct-care workers by supporting the rights of unionization, providing access to health insurance benefits, and establishing minimum-wage and overtime protections for home health aides. With support from the Ms. and Open Society Foundations, IWPR is working with the National Domestic Workers’ Alliance (NDWA) and others to provide research for the Caring Across Generations campaign. As PHI reports, over half (55 percent) of all direct-care workers—from nursing assistants or aides through personal care aides—have only a high school degree or even less education. Approximately 23 percent of all direct-care workers are foreign-born. Roughly 45 percent of direct-care workers live in households with earnings below 200 percent of the federal poverty level. All of these concerns fall heavily on women. The intersection of immigration and care work is a feminist issue, as Ai-jen Poo, Director of NDWA emphasizes in her outreach . The vast majority (89 percent) of direct-care workers across the United States are women. The majority of individuals 65 years old and over in the United States are also women, as are the majority of those who are unpaid family caregivers to the elderly or disabled. A recent Gallup poll found that 20 percent of women and 16 percent of men working part- or full-time in the United States also help with the caregiving for family members and friends. 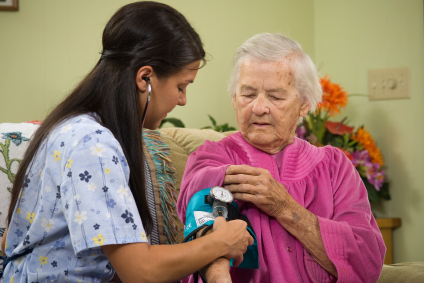 On December 15, 2011, the U.S. Department of Labor (DOL) announced that it is proposing a new regulation for the wages of home care workers. As Secretary of Labor Hilda Solis pointed out in a DOL blog post on December 15, 2011, women make up more than 92 percent of those who would be covered under this proposed revision to the Fair Labor Standards Act. Policymakers are beginning to take note of the issue of protections for caregivers, which is of special concern to women and to a growing number of American workers and families. IWPR will continue to research the quality of jobs available to care workers and to shed light on their needs. Jane Henrici, Ph.D., is a Study Director with the Institute for Women’s Policy Research (IWPR). Nina Pasha, and Mansee Khurana are former research interns with IWPR. Fantastic article, highlighting the need to support this group of workers, who are angels in disguise. They work long hours and they work from the heart. They deserve equality. Bravo to policy makers too who are striving to make a change as well.